Today’s tough life is full of stress and tensions which cause many problems and different diseases that are also accompanied by different types of body pains. A lot of people usually don’t take their personal body problems seriously, especially mild pain or swelling in their feet, which results in severe damage to the body down the road. Many of us don’t have much time to properly pay attention to our body and the pain it might be feeling. And even if we do, a lot of us don’t have the money that’s required to pay a relaxing visit to a spa. One of the most common pains being seeing nowadays is foot pain. The reason behind it is that a lot of people spend a majority of their time on their feet due to work. If you’re someone who’s dealing with foot pain take note that you’re not alone. Browsing the Internet will provide you with numerous options with regards to how you should treat foot pain. However, not all of these suggestions can be trusted. You need to do your research before you decide to treat your feet. A good option to opt for is a foot spa. They can be easy and effective devices which will help in increasing your blood flow and to make you stress-free and comfortable one you’re done with your busy schedule for the day. If you’re in the market for effective and reliable foot massagers, here’s a list of the 4 best home spas you can go for. The first spa in our list is the PIBBS Foot Massager FM3830A. Not only will this spa leave you with clean feet it’ll also help boost overall energy levels after allowing your body to relax during the spa session it’s able to provide. This spa machine helps in maintaining water temperature for a perfect massage at home. Its detachable splash field helps water not to spill out of water tub during use. It also includes a vibration system that helps to stimulate your feet. This spa easily covers your ankles and heels to make sure you’re able to experience a session that’ll make your body feel thankful for it. You can easily use it at home by filling it with water and plugging it in an electric socket. Switching the ‘ON’ button will start heating the water you’ve poured in. Take note that you must check the temperature of the water before putting your feet into the tub. You can also set the device such that it starts making bubble in the water which will help in rinsing and eliminating all the dead cells from your skin leaving your foot smooth and fatigue free. Each package contains one-foot bath massager which has a width of 14-inches and a depth of 6.5-inches. The device also comes with a 1 year of warranty. You can use any type of Epson salt or foot soaks. It is easy to use for size 13 feet. It maintains the water temperature as per your need. It includes two dual side foot pads to relax your feet. It also includes a storage band cord which can be easily removed. Splash shield helps in avoiding water spills during rise. Each accessory works with one another in order to give an effective foot massage. It is easy to clean and drain the water once the massage session is over. It is very easy due to being light in weight. The make of this device allows it to be long lasting. It lacks a remote control system which some users might not appreciate. Not suitable for feet that are too large. The Footsie footbath is another reliable foot spa that’s currently available in the market. You should know that the Footsie foot spa has been generally designed to provide you with a deep cleansing of your soles and to treat any foot pain you might be experiencing. Furthermore, it can be used to massage your ankles as well. The Footsie foot bath contains disposable liners, a carrier tray and even a footsie bath black kit. It also contains PTC heating semiconductors. The featured extra deep bowl enables it to be used by a range of foot sizes. It also includes different settings that allow you to control the heat and the vibration intensity this device is able to offer. Before using this machine, first of all you need to wash your feet properly before putting them into footsie foot machine. Turn on your machine by plugging it into an electrical socket. It’s up to you if you want to pour in water and allow the device to heat it up for you or you want to pour in pre-hearted water. After pouring water, switch on the spa. You can also add any oil or soap of your choice for more efficient service. After using you can brush your feet thoroughly and can apply any lotion oil to ensure the health of your feet. It can be easily used at home. Can heat up poured water very fast. It provides a vibrating massage. Easy to clean by draining water after use. You can add any preferred therapy oil or soap in the water. Can’t use products that cause some sort of foam to be created in the water. Can heat up water too much. The featured rollers can be tough for sensitive skin. Try and pour the recommended amount of water as spillage is possible. Nearing the end of our list, the next entry is the Kendal Foot Spa Massager MS0810M All-In-One Foot Spa Bath. This device also offers a variety of features to ensure that your feet and in turn your body feels relaxed. 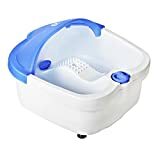 It works by using the bubble tank which includes jet holes, point massage beads and rolling massage wheels which help in relaxing your muscles and getting rid of dead cells and fatigue from your soles. This device is capable of offering a high-frequency vibration massage. The featured foot roller massagers in the tank help your blood to circulate properly. Furthermore, its speed heating feature helps in maintaining water temperature for an enjoyable spa session. It is easy to use at home. You can easily start your massage by putting some water in the tank and switching on the machine. The bubbles and heat will work to make poured water warm. You can use soap or any kind of oil or salt in the tank for more efficient cleansing. It includes three degrees of settings to provide you with the kind of massage you prefer. It is very portable due to being light in weight. You can use it if you are suffering from insomnia, fatigue or high blood pressure or even a cold. Not recommended for people with too large feet. No system to prevent water spillage. The Conair foot spa is the last entry in our list of the 4 Best Home Foot Spas. Similar to the other devices mentioned above this spa is also effective in offering you a spa treatment that makes your feet look healthy and leaves your body feeling refreshed. 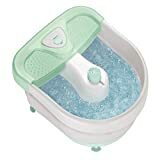 The Conair foot spa features a small tub which workswith hot water. It also offers bubbles for more stimulation. This device is able to maintain the temperature of the water while your spa session lasts. It also contains 3 pedicure attachments that include single large, double large and pinpoint nodes. Furthermore, it also includes leg rest and spot massage functions. The ‘On/Off’ switches make it very easy to use for everyone. It is very effective in massaging your feet and toes because of the deep tub. Simply connect it to an electrical supply, pour in warm water, turn it on, and allow this device to take care of your feet. The featured large tub ensures that it can be used by a variety of different feet. You can use different pedicure attachments as per your choice. Toe touch button activates bubbles and heat. Comes with non-slip feet, so the device remains in place during use. It can only be used up to 15 minutes at a time. Whenever you’re in the market for a reliable foot spa, you should make sure that you’re choosing one that’s able to provide you with everything you need. It should be easy to use, come with accessories, and offer more than one setting. While all four suggestions above offer value, the PIBBS Foot Bath Massager FM3830A is a good one to check out. It’s not only able to provide you with a soothing spa experience, but it’s also able to accommodate a variety of feet, lessens spillage, offers various settings, and more. Remember that you can select any spa mentioned above; just ensure you make an informed decision.